Brandon Tyrone Marshall was born on the 23rd March 1984, in Pittsburgh, Pennsylvania USA, and is known as a professional football player, who plays in the position of wide receiver in the National Football League (NFL), for the New York Jets. Previously, he has also been a player for the Denver Broncos, Miami Dolphins and Chicago Bears. His professional playing career has been active since 2006. Have you ever wondered how rich Brandon Marshall is, as of mid- 2016? According to authoritative sources, it has been estimated that the size of Brandon’s net worth is as high as $18 million, with the main source of his wealth coming from his successful involvement in the sports industry as a professional football player. 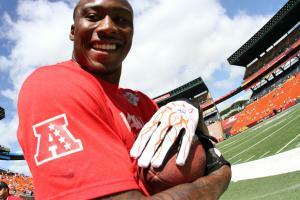 Brandon Marshall spent his childhood divided between Georgia and Florida, where he attended Lake Howell High School. During high school, he began playing football in the school’s football team, in the positions of both offense and defense. As he excelled, Brandon was not only named for All-State honors, but also the Seminole County Utility Player of the Year. Besides football, he was very active in other sports activities, such as basketball and track and field. After he matriculated from high school, Brandon enrolled at the University of Central Florida, where he continued with his football career, playing as a wide receiver, and during his career in college he recorded a total of 112 receptions, 1,674 receiving yards and 13 touchdowns. His professional career began in 2006, when he was selected as the 119th overall pick in the NFL Draft by the Denver Broncos. In his first season, Brandon had 20 catches, 309 receiving yards, and two touchdowns, but from the second season his numbers began to increase, as he had 1,325 receiving yards, 102 receptions, and seven touchdowns. He stayed with the Broncos until 2009 recording two more seasons of 1000+ receiving yards, but was traded to Miami Dolphins for a second round pick of the 2010 draft and second round pick of the 2011 draft. Upon arrival at the Dolphins, Brandon signed a contract worth $47.5 million over four years, which increased his net worth by a large margin. He continued successfully in Miami, however, he was traded to the Chicago Bears in 2012, and in the first year for the Bears, Marshal recorded 118 receptions, 1,508 receiving yards, and 11 touchdowns, which was his best season in the NFL to date. After three successful season for the Bears, Brandon was straded to the New York Jets, and improved further his performance, having 1,502 receiving yards, and record of 14 touchdowns. Thanks to his great performance throughout the career, he received numerous accolades, both as a part of the team and as an individual; he has six Pro-Bowl appearances, 2008, 2009, 2011, 2012, 2013 and 2015, he was named as the Pro Bowl MVP in 2011, and was named into the First-team All-Pro in 2012. Furthermore, Brandon is a member of the 10,000 receiving yards club, and holds several records, including for the most receptions in a game in NFL history with 21, most seasons with 100+ receptions, and he is the first player to have a 1,000 receiving yard season with four different teams. When it comes to speak about his personal life, Brandon Marshall has been married to Michi Nogami since 2010; the couple has a pair of twins. Brandon is recognized for his charity work, but he also had numerous problems with police, as he has been arrested several times for assault, battery, domestic violence, abuse and others. He has also been diagnosed as a borderline personality disorder.